I'm really not a winter person. I like a good snowfall for the holidays but after that, I'm ready to be done with the cold weather. January is typically the worst of it so I was happy this weekend when temperatures hit above zero and we got a very brief taste of spring. And with thoughts of spring comes an urge to freshen up the indoors. I'm craving simplicity and lightness these days. Really, I just want to paint everything white. The charcoal grey walls at our entryway were trendy seven years ago but now they're just feeling heavy and oppressive. Our living room has too much brown - that brown microfibre sofa has to go! I'm moving towards less colour and more texture, more black and white. And no matter the season, stripes seem right, especially ticking stripes. 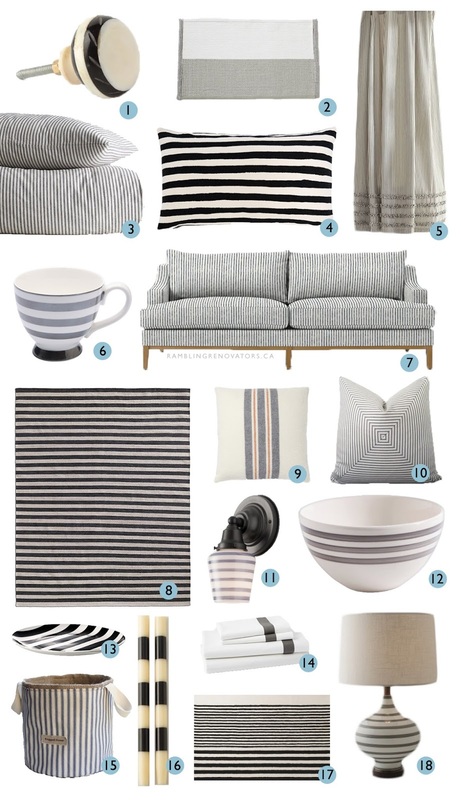 Patterns seem to be shifting from graphic bold beach stripes to narrower stripes. They seem like a neutral to me and work well with florals and bright colours. Sounds just right for spring!